Author: Chepaitis, Barbara Set In . . . Description: From the author of Feeding Christine and These Dreams comes a delightful story of family, love, and life's many unexpected pleasures. At age thirty-one, Delilah needs a plan. Still living with her parents on their Key West estate, with no career to speak of and a dull relationship with a self-involved artist, she is beginning to feel as if life is sailing swiftly past her. Her sister is living the perfect life with the perfect husband, her father con-tinues to make money off the stock market, and her mother continues to spend it on the latest social cause. Delilah would love to save the world as well -- if only it weren't such an overwhelming task. She longs for inspiration. Little does she know that it will soon come in the shape of Carla, -- a former tiger tamer and Delilah's long-lost biological grandmother. Long-lost, that is, until now. When Delilah's mother unwittingly discovers the identity of the woman who put her up for adoption years ago, Delilah is enlisted to visit Carla at her dilapidated farmhouse in rural New York. The first meeting does not go well. Aside from her constant gruff commands and occasional meddling in Delilah's love life, Carla barely says a word to her newly discovered granddaughter, who is more like her than either of them would care to admit. Slowly, however, the two are drawn together by the beauty of the land, by the good friends around them, and by a love as unpredictable as life itself. Soon Delilah discovers that saving the world requires the courage to be saved and that truly embracing life means accepting its uncertainty. "Because love was always unpredictable. And slightly out of control." 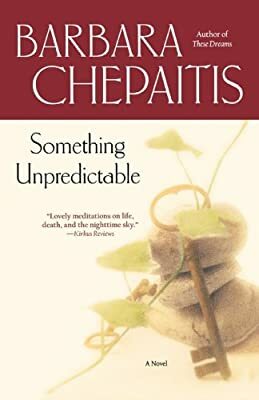 With her trademark humor and warmth, Barbara Chepaitis tells a wonderful story about one woman's stumble upon happiness in the most unlikely of places. She creates characters that are "genuinely human" (Publishers Weekly) and in so doing reflects our ability to love the world and each other despite our many flaws and failures. Smart, funny, and true, Something Unpredictable is a gem of a novel and one to be dearly treasured.